Several years ago, Elsewhere received the Sakura Medal, an award given by the students of the various International Schools in Japan. I was delighted to receive this award because it comes with an actual medal* and, if you knew me, you’d know I like to obnoxiously bestow FAKE medals all the time. The “doing the dishes” medal, say. Or the very prestigious “cleared all the old television shows from my DVR” medal. Or the rarely given but hugely coveted “managed to not check Amazon.com for a month” medal. Now, the strangely appropriate thing about this story is that a Japanese-language film version of Memoirs of a Teenage Amnesiac is currently shooting in Tokyo. The movie has been re-set to happen at an International School and, of course, translated to Japanese — much else remains the same from the book. I know this because I wrote the screenplay. The movie stars Kenichi Matsuyama (as James now Yugi), Yuya Tegoshi (as Will now Mirai), and Maki Horikita (as Naomi still Naomi — Naomi is a Japanese name; I picked it for the book because the Japanese characters translate to beautiful correction — strangely appropriate again, I’d say). I am told that, if I were a Japanese teenage girl or even Japanese, I’d be screaming wildly at this cast. As the movie is set at an International School, there will be two young, well-known American actors in the cast — more on them later. You can read a wildly inaccurate article about the movie from Variety that doesn’t mention me or the book at all. On other fronts, Love is Hell, the anthology I’m in along with Justine Larbalestier, Melissa Marr, Scott Westerfeld, and Laurie Faria Stolarz is now in stores and available for purchase online. I know this because I’ve been getting quite a bit of e-mail about my story and yeah, I’ll try to post something in response to your very intriguing queries in the not so distant. Aside from the fact that he refers to me as Gabriel, Scott Westerfeld** does an awfully good job synopsizing the anthology on his blog. What I’d add to that is Publishers Weekly called the book “consistently supple” — which sounds to me rather like a fine leather sofa and possibly an oxymoron, depending on which definition of supple one’s chosen. Oh reviewers, how you tease me with your ADVERB + ADJECTIVE praise construction. Over the course of my career, I’ve been “playfully touching,” “darkly whimsical,” “effectively taut” — actually, this is starting to sound sort of dirty; we had better quit here. Re: the photo. Readers of Memoirs will recognize this as the first scene of the book: James (now Yugi) runs to Naomi who is lying at the bottom of the stairs with the rescued camera. More pictures to come as I get permission to post them. *I’ve been fortunate enough to win several prizes over the years. (And really, how nice for me! I thought my prize-getting days had ended with the 1995 Spanish River High School Senior Awards Assembly.) The most recent thing I won was the Delaware Blue Hen Teen Book Award for Memoirs which came with a very nice certificate (Thank you so very much, Delaware teen readers and librarians!) 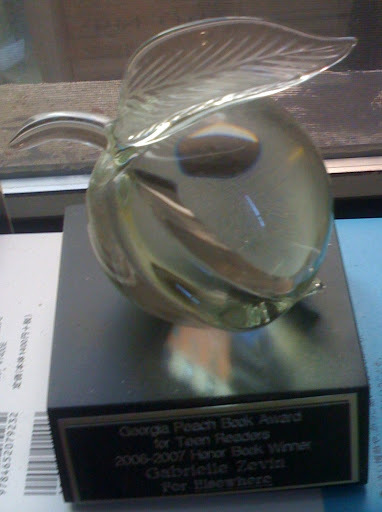 — but my favorite prize is the Georgia Peach Teen Book Award. Honorable Mention for Elsewhere came with a beautiful blown glass peach. In my opinion, all awards should come with blown glass fruit. **I am rarely told I resemble anyone but I have, on several occasions, been told I look like the girl from the cover of Scott Westerfeld’s Extras. Mostly this happened on my 2007 Book Tour — I suspect it was because everywhere I went, Scott Westerfeld had just been there the day before on his own book tour for Extras. I was thus bombarded by tales of Scott Westerfeld’s epic charm and wit. e.g. “Scott Westerfeld wore his pajamas! Isn’t that awesome?” Or once, in a city Scott Westerfeld HAD NOT yet been, I asked, “So, was Scott Westerfeld just here?” And the librarian turned to the bookseller who had arranged my appearance and said, “No, but could you get us Scott Westerfeld next time? We LOVE him! And has anyone ever mentioned that you look like the girl from Extras?” So yeah, buy Love Is Hell. I’m liked, but I’d say Scott Westerfeld is well liked, and therein lies all the difference. 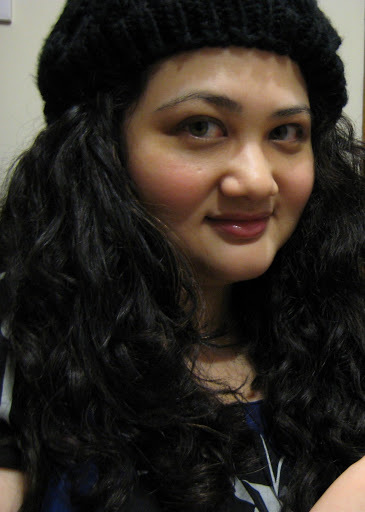 For comparison’s sake, a picture taken of me by my mom from my birthday just past. I really should be liberally cropped and scowling more to be the girl from Extras. The girl from Extras. She should be scowling less to be me. And she should really do something about that crazy eye. The Writing Life #3: The Story of the First Bit of Creative Writing I Ever Got Paid For and/or a Gossip-y Anecdote Featuring Vampires! Hello from Tokyo! This is Hans–I’m directing this movie. Kenichi is one of the most naturally gifted actors I’ve ever encountered. He might be a genius. He’s a really romantic, tortured and beautiful Yuji (James). Tomorrow during the day we shoot the cameras on the steps scene with Yuji and Naomi, then tomorrow night we shoot the sledding on the steps. We also have 3 other scenes we’re shooting tomorrow. This schedule is insane, but I love it! I’ll give you updates on working with Maki, our Naomi, and Yuya, our Mirai (Will) soon. All three stars work tomorrow. Next week the two American stars get here. Kenichi has already challenged our Ace (name to follow) to a samurai sword fight (with plastic swords, of course). A big omedeto (congrats) on the Japanese film adaptation of your novel and your writing the screenplay. Very cool! Wendy — Arigato-gozaimos! MIDORI BY MOONLIGHT sounds very cool, too. Hello Gabrielle! I'm a lurker on your blog, but I'm very excited to hear about the Japanese adaptation of your novel, as it stars two of my favorite actors – Kenichi & Maki (they've worked together before! ), and I'm looking forward to its US release (I'll even brave L.A. traffic to see it in a fancy theater.) Two well-known American actors, hmmm? Ooh, the suspense. hello, dianne from indonesia here. i’m so excited that memoirs is being adapted to japanese movie. and yes, the casts are well famous japanese idols. actually i know about the novel and movie becoz one of the actor yuya tegoshi, but i’m waiting for the novel to be arrived and i will read the book. read many good reviews about memoirs already, i can’t hardly wait to read it.good luck on your writings ^^ i will also read elsewhere. Hi Princess from the Philippines,I’m shooting with Yuya today. Not only is he very committed to his role and acting craft, but he’s a very sweet person. It’s really a joy working with him.I’m also shooting with Kenichi and one of our American actors. Kenichi is teaching us how to wield ninja swords. He’s a super-talented actor. To Mr. Hans,that is so cool! And I can’t wait to see who the two other American actors are! I can just MatsuKen wielding those swords, haha (L with a sword. cool)To Ms. Zevin,I’ve read the article from Variety and it’s really mean… I think if they’re going to write something like that, they should’ve at least conducted some research about it so that other people (esp. the author, which in this case would be you) wouldn’t feel bad. http://www.amazon.co.jp/%E5%A4%B1%E3%81%8F%E3%81%97%E3%81%9F%E8%A8%98%E6%86%B6%E3%81%AE%E7%89%A9%E8%AA%9E-%E3%82%AC%E3%83%96%E3%83%AA%E3%82%A8%E3%83%AB-%E3%82%BC%E3%83%B4%E3%82%A3%E3%83%B3/dp/4652079230/ref=sr_1_4?ie=UTF8&s=books&qid=1228887840&sr=8-4This is the link to the Japanese language version at Amazon Japan. ms.zevin, thank you for your reply. i should get memoirs around x’mas so it will be a perfect gift for me. and yes, update us with the movie news and pics. i don’t think you can post anything on yuya though, his agency is really strict *sobs*mr.hans, thanks for your report on the filming. how’s working with japanese actors and actresses? is language becoming a barrier? i hope not! Hi Gabrielle! I heard that your book Memoirs of a Teenage Amnesiac is being made into a Japanese film, and I’m really excited for it! I heard about it because I’m a huge NEWS fan, of which Yuya Tegoshi is a member, and I’m also a huge YA lit fan, so I ordered your book right away. I’m going to read it after I finish finals.Anyway, I’m so happy this is going to be a film. And yeah, if you were a Japanese teenage girl, you would go crazy over this. All of the actors are very popular young actors–in Tegoshi’s case, he’s also an idol–and do lots of movies and dramas.Hi to Hans, too! Hope filming is going well. It’s great to hear the actors are committed to filming. And I heard Anton Yelchin will be in it, too? I really hope this film premieres in the US. I will totally be there. Hi Laura. Yes, Anton is here and shot his first scene. He’s a terrific, inventive actor, and already very funny in his character. Can’t wait to shoot with him and Maki all week. He has great chemistry with Yuya, Kenichi and Maki. I love my cast! Glad to hear filming is going well and the cast is great. Do you know yet if the movie will make a US premiere (as I hope it will)? Hi Laura, We don’t know, but we hope so! This is really a fantastic news!Memoirs of a Teenage Amnesiac.W-O-W…A-M-A-Z-I-N-G.The book did leave me a strong impression on it.it made me go "awww." i like Will by the way. (yay!team Will! *grins*)& when i found out that Yuya Tegoshi will potray the role of Will,it's like-SERIOUSLY? !i had to read the book all over again while picturing all the cast into my mind.it doubled my excitement on reading it for what?—5th time?haha!gambatte,Mr.Hans!&Miss Gabrielle,hands down to you!Congratulations! hello minna!! !i don’t have a blogspot account but i do have my multiply. my name is also gabrielle but my friends call me gabbie. hehe, ms. gabrielle, we both have the same name! by the way i’m 15 years old from the philippines. i want to read your book so badly!!!mr. hans, good luck on the film! when i saw that tegoshi yuya will be one of the cast i almost died! i like him so much!!! i hope you could tell him how much i’m excited for him! if you have time i hope you can drop by my multiply! http://gubbiedubbie.multiply.com pardon my website for it contains things about tegoshi. hehe.congratulations again ms. gabrielle and mr. hans! I really hope it Memoirs gets a US premiere. I finished it a couple of weeks ago. It’s such a great story, and it’ll make an awesome movie. I adore Will, and Tegoshi is really perfect for the role. He seems like he could play the-best-friend-who-becomes-more really well. I think Maki, Kenichi, and Anton will also be wonderful. It’s really a strong cast.My friend and I were discussing this the other day, and we wondered if the part where Naomi cuts her hair would be left in, since Maki has short hair. It’s an important moment in the story, so we weren’t sure. Also, if there were difficulties with remaking Memoirs for the Japanese audience. Actually I’m wondering the reason of why their is a Japanese version. Great book by the way! We’re done! Finished shooting the movie on my birthday. A strange coincidence – the last scene I shot was Naomi’s birthday, when she gets the “CD” from Mirai, delivered by Yuji. The last shot was a close insert of the gift. And then we wrapped. Congratulations Mr. Hans!Actually,few days after I posted here I got passed to be a voluntary extra and attended few days and all I can say is I really need to read the book to understand it more. :)Thanks to Anonymous for posting the link!It was all fun during the filmings!Im so happy to be a part of it eventhough im just an extra.=)It was my first time maybe the last(but who knows),and it was really awesome experience!I really hope this movie will be shown in the US too!I can’t wait for it now,since it’s being featured to some J-Movie Magazines already.More Powers and Happy Birthday Mr. Hans! Hi Aki – I hope that you were on one of the warmer days. Most of the shoot was brutally cold. Hope you had fun! kyaa! congrats mr. hans! i can’t wait to see it!! !i hope Tegoshi did a great job! i’m sure he did! I just wanted to say your story in Love is Hell was fantastic, my favorite by far. Love your books, excited about the movie. I am actually reading the audio book now. I've heard of Elsewhere but, I've only heard of Memoirs of a Teenage Amnesiac from a lot of American girls online. (I'm from England)- I'm loving it! I only intially began listening so I could get a feel for what it may be about before the film came out. (I'm a HUGE Maki and MatsuKen fan; and recently a Tegoshi fan! )But I got sucked in. I realised it will probably be MONTHS before I can watch the film but I can't help but be excited over it.